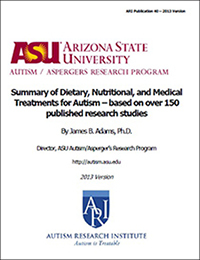 ANRC Essentials Plus is an improved version of a vitamin/mineral supplement demonstrated to greatly improve the nutritional status of children and adults with autism in a major randomized, double-blind, placebo-controlled research study at Arizona State University (ASU). "We used the results of several previous studies of individual nutrients to design a comprehensive multi-vitamin/mineral supplement that could improve many different aspects of nutritional status. 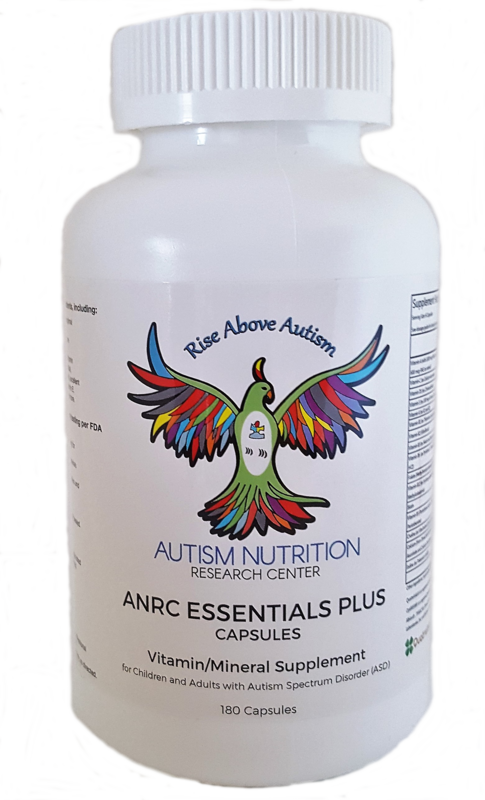 We have been doing research on vitamins and minerals for children with autism for over 10 years, and we are very pleased to see that research culminate in the release of ANRC Essentials." Many vitamins and minerals at doses determined to be optimal based on research studies. Highly-bioavailable forms of all ingredients, so that they are well-absorbed. Special ingredients for individuals with ASD. Methyltetrahydrofolate (MTHF as Quatrefolic®) – one of the most bioavailable forms of folic acid. High amounts of vitamin B12, which works in conjunction with MTHF. Excellent source of sulfate, which is usually low in ASD. L-Carnitine, to provide energy for the body and the brain. Mixed vitamin E (primarily gamma-tocopherol, which is the primary form in fruits and vegetables). Mixed carotenoids (the precursor for making vitamin A) and some pre-fromed vitamin A as retinyl. Two forms of vitamin B6 (both pyridoxal HCl and P5P) for optimal B6 metabolism. Lithium – many children with autism/ASD and their mothers have low levels of lithium. For more information see here. Four forms of vitamin B3 (niacin, niacinamide, NADH, and nicotinamide riboside), to ensure substantial increase in NADH, the bioactive form of B3. Note that our previous study (Adams 2011) found NADH was significantly lower in ASD, and a recent study found nicotinamide riboside was significantly lower in children with ASD. 1Free of all common allergens, including gluten, dairy/casein, eggs, soy, corn, fish/shellfish, peanuts, and nuts. 2Exceptionally pure. We carefully test and then select raw materials that are the purest forms available. 3Free of artificial colors, artificial flavors, preservatives, fillers, and GMOs.